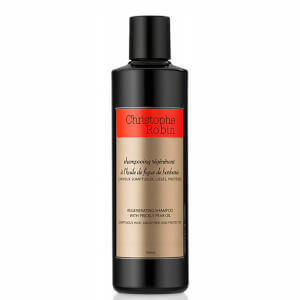 Discover an essential set of products with the Detox Hair Ritual Travel Kit from Christophe Robin. Housed inside an exotic, cotton cosmetic pouch, the set is ideal for those with combination hair; oily roots and dry ends. The travel kit boasts a daily shampoo, cleansing scrub and hydrating hair cream, each guaranteeing to deliver a comfortable scalp and enviably shiny hair, even whilst on-the-go. Free from Parabens, Silicone and Colourants. Rebalance and refresh the hair and scalp with Purifying Shampoo; a lightweight, innovative formula that works to eliminate dandruff and relieve itching. Suitable for daily use, its unique blend of Jujube Bark and Cherry Flower Extracts provides instant anti-dandruff action to minimise flaking, whilst regulating excess sebum and soothing the scalp for long-lasting comfort. Ideal for hair with greasy roots and drier ends, you can expect touchably soft, radiant locks and a calm, restored scalp. Treat a sensitive scalp to intense levels of support and defence with the Cleansing Purifying Scrub. Created exquisitely to perform actively and acutely on impaired, delicate areas, relieving skin of the critical stage and arousing the scalp into renewal. Working through naturally embedded Sea-Salt, the oceanic-extracted additives lend a tone of refreshment and lightness, whilst the imbued renewal complex intimately modifies and enhances the body’s innate system, helping to supplement skin with optimum levels of moisture, hydration and upkeep. Fight against dry hair with the ultra-conditioning Moisturizing Hair Cream. 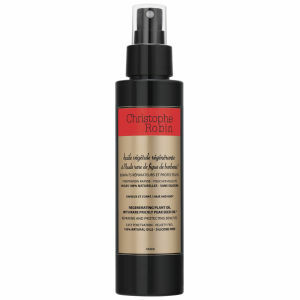 The non-greasy, non-sticky formula is ideal for rehydrating dry and thirsty hair. Expect to reveal locks with a new shine and gorgeous volume. The sweet smelling cream is a leave-in conditioner with an intense formula that can work to repair split ends of weakened hair. Shampoo: Apply on wet hair, emulsify then rinse abundantly. Scrub: Work one tablespoon of the scrub into a wet scalp, adding water to help bring to a lather. Rinse well after use. Hair Cream: Apply a small quantity of moisturizing hair cream on towel-dried and/or dry hair, concentrating on the ends and delicate hairline. Shampoo: Aqua (Water), Sodium Myreth Sulfate, Peg-18 Glyceryl Oleate/ Cocoate, Disodium Cocoamphodiacetate, Cocamidopropyl Betaine, Peg-7 Glyceryl Cocoate, Glycerin, Propanediol, Parfum (Fragrance), Polysorbate 20, Citric Acid, Polyquaternium-10, Zizyphus Joazeiro Bark Extract, Prunus Serrulata Flower Extract, Disodium Edta, Phenoxyethanol, Sodium Acetate, Isopropyl Alcohol, Sodium Chloride, Sodium Benzoate, Benzyl Salicylate, Linalool, Limonene, Hexyl Cinnamal, Citronellol, Butylphenyl Methylpropional. Scrub: Sodium Chloride, Sodium Laureth Sulfate, Aqua (Water), Butylene Glycol, Cocamide Mea, Glyceryl Stearate, Peg-100 Stearate, Saccharide Isomerate, Hydrated Silica, Bisabolol, Menthyl Lactate, Prunus Amygdalus Dulcis (Sweet Almond) Oil, Parfum (Fragrance), Phenoxyethanol, Benzyl Salicylate, Linalool, Limonene, Citronellol, Hexyl Cinnamal, Butylphenyl Methylpropional, Evernia Furfuracea (Tree Moss) Extract, Citric Acid, Sodium Citrate. Cream: Aqua (Water), Isononyl Isononanoate, Glycerin, Prunus Armeniaca (Apricot) Kernel Oil, Ethylhexyl Methoxycinnamate, Polyacrylamide, Butyl Methoxydibenzoylmethane, Pterocarpus Santalinus Wood Extract, C13-14 Isoparaffin, Hydrogenated Polyisobutene, Parfum (Fragrance), Laureth-7, Carbomer, Hydrolyzed Wheat Protein, Hordeum Vulgare Seed Extract, Triethanolamine, Disodium Edta, Phenoxyethanol, Benzoic Acid, Butylphenyl Methylpropional, Alpha-Isomethyl Ionone, Limonene, Linalool, Citral, Bht, Benzyl Alcohol, Dehydroacetic Acid, Ethylhexylglycerin, Sodium Benzoate, Potassium Sorbate. Shampoo: 75ml / Scrub: 40ml / Cream: 20.7ml.